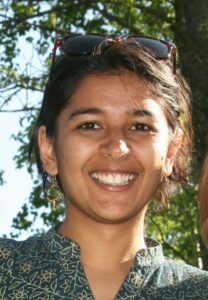 The Honorable Mention for The Sylvia Forman Prize for outstanding graduate student paper will be awarded to Sahana Ghosh, for the paper “Security Scripts: Gendering Everyday Mobility and Civil-Military Relations under Surveillance in India’s Eastern Borderlands,” advisor Inderpal Grewal, (Yale University). Ghosh’s paper analyzes the gendered contours of military action in India’s eastern border. As India drives an increasingly militarized border security agenda along its officially ‘friendly’ border with Bangladesh, its preemptive practices to control the illegal movement of people and goods are directed to routes and movements within the Indian borderlands. How, and in what forms and scales, are threats and dangers embodied and made concrete for the policing of suspect mobilities by the Indian security forces from their abstract mandate of ‘national security’? Focusing ethnographic attention to everyday journeys by foot and various shared vehicles, this article proposes the idea of ‘security scripts’ to think about an interactive co-production and socio-spatial experience of border security by residents and security force personnel alike. It argues that how people choose to move, what routes they take, the rhythms of those journeys, and socialities on the move are key to life in a highly surveilled space and shows how security practices transform the borderlandscape into a gendered geography. This focus on the intersections of affect and bodily experiences with the material dimensions of spatial practices urge a rethinking of the forms of knowledge through which security states are formed and constrained, showing that visible militarized encounters and the life of law have afterlives in numerous times and spaces of everyday life.